Twist targets all the most important trunk rotation muscles (shoulder, back and abdominal muscles). In this model legs rotate and trunk stays fixed. Twist is equipped with range limiters and isometric strength testing possibility. Only available as analog. The mechanism under the seat can be used to set the movement start point. 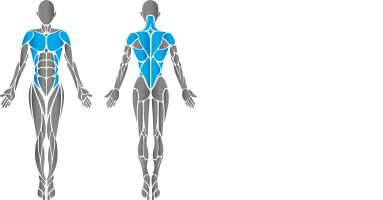 Dual function equipment allows exercising both sides of body, left and right. Back support can be adjusted for comfortable use.